All tests were run in our custom built computer to best reflect real life performance. The computer remained in the same place and room throughout all tests. The ambient temperature in the room was around 22c. The thermal paste applied to each cooler was stock respective to their manufacturer's to rate its performance; all pastes had sufficient time for them to settle. The fans on all heatsinks were connected to the same motherboard 4-pin connector. The test computer was turned on and idling for at least one hour for the idling tests. High CPU load results were obtained using the Prime95 in place large FFTs test with four worker threads for a minimum of fifteen minutes, and recorded when the temperature was deemed stable. Comparisons were made to other water coolers and one air cooler, while as many variables as possible were kept constant. 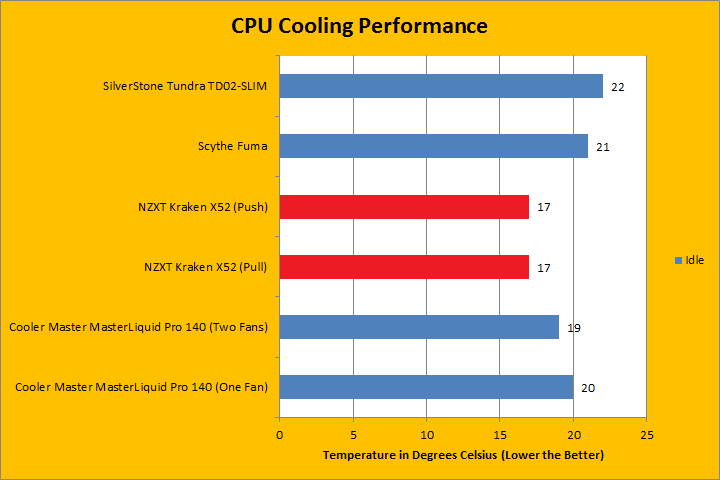 There was one other 240 mm cooler on the list, the SilverStone Tundra TD02-SLIM, while the Cooler Master MasterLiquid Pro 140 is a 140 mm cooler. They should give good references for comparison. The NZXT Kraken X52 was mounted to the front of the case with both fans attached. Both the push and pull configuration were tested. The temperature results for each cooler was measured with CoreTemp, which reports the CPU's integrated digital thermal sensor for maximum accuracy. Each temperature result was calculated by taking the maximum value of the cores inside the CPU. After idling the computer for more than an hour, the temperature stabilized at 17 degrees Celsius for both the push and pull configuration. This is the lowest of all the other results on this list, as expected. One of the main reason why it performed so much better than the SilverStone Tundra TD02-SLIM was because the NZXT Kraken X52's radiator was a bit thicker. The 120 mm fans' RPM were also fairly low at this point, so it was nice and quiet. I always find the idle tests to be a very small indication of a cooler's overall performance, so let us not waste more time, and have a look at the load results. 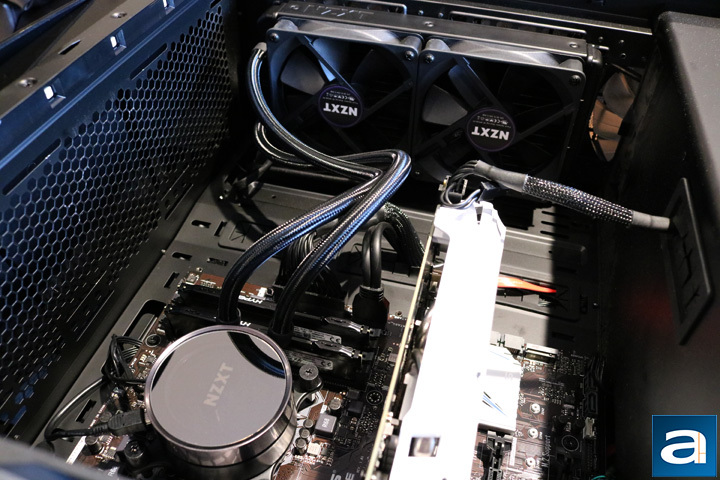 The NZXT Kraken X52 performed the best out of all the coolers on this list once again under load, stabilizing at an impressive 48 degrees Celsius a pull configuration and 47 degrees Celsius in a push configuration. It did 9 and 10 degrees better than the next closest cooler in a pull and push configuration, respectively, and did not even make too much extra noise. The more traditional push configuration did one degree Celsius better than fans pulling the air through the radiator. In both cases, the NZXT Kraken X52 did exceptionally well. I think we can safely say the new performance engineered pump is doing its job -- and quite well at that. 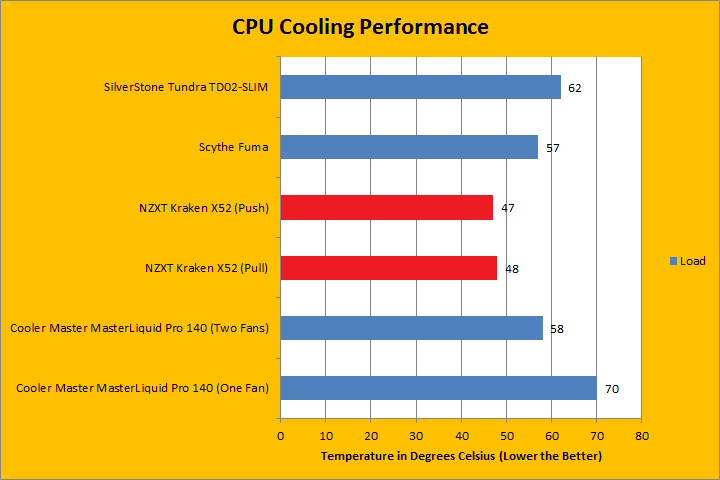 Comparing it to the other 240 mm sized radiator on this list, the Kraken did much better. The results are great, but did it sacrifice silence for performance? For anyone not using over-the-ear headphones to block out everything except your game or music, sound is pretty important to the enjoyment of using your computer. Using a scale between 0 and 10, where 0 is silent and 10 is a jet taking off, I would rate the NZXT Kraken X52 at 3.0/10 at idle, while under load, the sound comes in at 4.0/10. The RPM of the fans really ramp up to keep the system cool, but they were mostly silent during idle. Noise from the pump was mostly quiet. Generally speaking, depending on your sensitivity to noise, the NZXT Kraken X52 will not be adding too much more noise to your system while keeping it under safe temperatures. Perhaps if you are very picky with noise emissions, you could change the RPM range of the pump or the fans, but that will affect cooling performance. posted 6 hours and 8 minutes ago, with 11 posts.